Swathi's post today is a traditional ,healthy breakfast recipe, which is her mom's favorite and one that is very close to her heart.Thanks Swathi, I am so happy and honored to have you here. When my friend Suja of Kitchen Corner Try It asked me to do a guest post for her, I immediately said yes. Blogging has brought me a few, but great friends and she is one of them; she started her blog roughly six month after I started. She never fails to stop by whenever I post and if I need any help I can ask her. She will not say no to me. She has cute little boy who just started pre-school. She is from Kerala, my home state in India, and is an excellent cook, great blogger, great mom and friend. Since she knows that I am busy and crazy with two kids, she gave me freedom to choose recipe. I choose this recipe as it is close to my heart. My mom used to make it very often. She makes regular dosa (our south Indian crepe), Adai (rice and mixed lentil crepe) and Kalikanji dosa. It is one of the traditional Tamil Brahmin cuisines. She used to makes it once a week, when she ran out of batter for regular dosa. Both I and my sister usually would have it with sugar. My father would choose some spicy chutney /pickle or curry. I was planning to make this for long time; however I had only vague memories about this recipe. I told my father during a phone conversation that I am missing kalikanji dosa which amma used to make it. I don’t how to make them. Then he gave me the recipe. I never learned any cooking from my mom, and I got interested in cooking only after staying alone. Meaning running out tasty food option? Yes I did that. This recipe is made only with rice flour and coconut and salt, one step in the cooking process make its really soft crepe. You don’t need any overnight fermentation like dosa, only need is to soak the rice for about 3 hours grind it into smooth batter and set aside a portion of the batter and then cook the batter to form poridge and add it to the batter. Make pancakes as soon you need it. It’s yummy and you only need a spicy side dish to dig in. Try it and it won’t disappoint you. Wash and grind the rice with1/2 cup water in grinder or blender. After grinding rice set aside ¼ cup of rice batter and add coconut and grind once again to combine everything well. In a small sauce pan heat ¼ cup rice batter you set aside with ¾ cup water for about 2 minutes with constant whisk to prevent forming clumps. Batter should be cooked and have nice shiny white /transparent in color. Add this cooked batter to remaining rice –coconut batter, add salt and ½ cup water to form a loose crepe or pancake like consistency. Heat favorite girdle or skillet and brush with oil and pour ¼ cup of batter and spread it in a circular motion to form a 9 inch circle. Add few drops of oil around the side of circle. Cook for 30 seconds on one side and flip the other side and cook for another 30 seconds. Once it is done it have small brown spots. Mainly white in color. Enjoy with any spicy curry. They are soft and delicious. Thanks Suja, for giving this wonderful opportunity. I am happy to be a guest on your blog. Nice post Suja and Swathi.It's so meaningful to see how the friendships in the blog world can bring the best in everyone.. Superb recipe and nice presentation ! Dhyuthi,blogging has been a wonderful journey,glad to have met so many wonderful friends,you all rock! Very interesting recipe..Never heard n tried..Sounds very tasty, defntly gonna try this soon!! Bookmarked! Thanks Priya,Srividhya and Wan for the sweet comment. 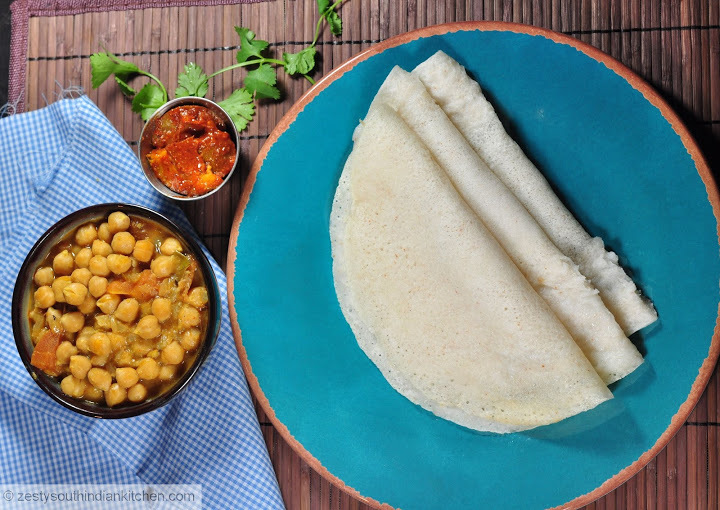 Lovely guest post...Lovely delicious dosai...even my mom prepares this but rarely. Thanks Kaveri,this is a new dish to me.Swathi's mom often makes this,mom's recipes is always the best and so close to heart..
wow very healthy recipe dosai,luks gr8! Wow, fantastic guest post by Swathi,this non fermented dosas looks fabulous and definitely helpful for many of us. Btw dosas looks super spongy and soft. 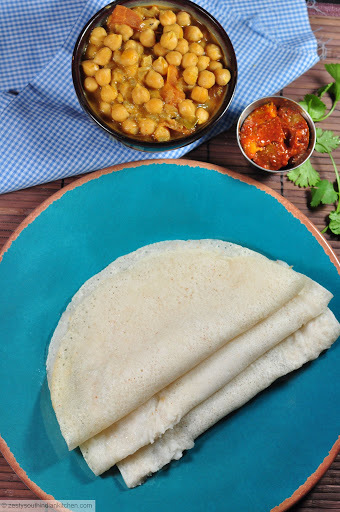 Thanks Prema,PT and Priya,you said right Priya,definitely helpful for many of us,especially busy days or sudden unexpected guests..
dosa are very soft and seems spongy too..
Love these rice pancakes with that delicious coconut added in! The picture is so pretty too with that blue plate as the backdrop. I want to reach in and eat it. First time here!! !Super spongy non fermented pancakes!!! Lovely guest post Swathi..
Love this rice pancakes, wonderfully made Swathi. Kudos to Swathi and Suja both. Suja..ur friend's guest post is superb. Looks yumm and tempting. what a beautiful recipe. thanks to both of you. life saver for quick breakfasts. We call it panpolo in Mangalore. ANd it is folded in a triangular shape. I love it. The dosas look super soft and such a lovely recipe..
lookks great. hopped over from swatis.